Pair of Finger Dental Toothbrush for Dogs. 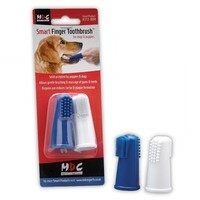 Each finger tooth brush is soft and pliable, easy to slip onto your finger making rubbing gel onto your pets teeth much easier. Each tooth brush has two sides, a more knobbly and a softer fine rubber bristled side ensuring your pet will be happy whilst you clean the teeth. It's particularly easily accepted by dogs and cats and is useful in getting to hard to reach back teeth. Much easier to use than a full toothbrush, great price. These are great for my greyhounds - just the right size. One dog is happy for me to do her teeth with whatever I choose but the other is very wary. Even he accepts this better than handled dog tooth brush and the finger cloth that I have tried previously. I imagine they would be too large for small-medium dogs though. Massive brushes!To give you an idea of the size,the head of the brush is nearly 28mm from front of bristles to rear of brush. The brushing length is about 20mm. We have a CKCS they are far to big for her mouth. Would suggest only suitable for larger breeds of dog. A little large for my JRT mouth but much simpler and easier to use than a toothbrush.